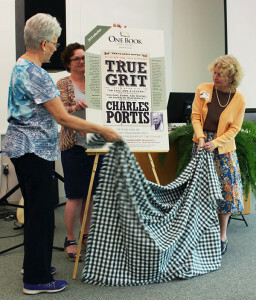 Longtime One Book One County Montcalm supporter Carole Cole, on left, Montcalm Community College Library Director Katie Arwood, in back, and Carson City Public Library and Crystal Community Library Director Beth O’Grady unveiled the 2016 One Book One County selection, “True Grit,” by Charles Portis, during a May 19 kickoff celebration at MCC’s Beatrice E. Doser Building on the college’s Sidney campus. SIDNEY – “True Grit,” by Charles Portis, is the book everyone is reading as the 2016 One Book One County Montcalm selection. The title was announced to a crowd of more than 100 people during a May 19 kickoff at Montcalm Community College’s Beatrice E. Doser Building on the college’s Sidney campus. Considered as a great American adventure story, “True Grit” was first published in 1968. It tells the story of Mattie Ross, who is just 14, when a scoundrel named Tom Chaney murders her father in Fort Smith, Ark. Mattie leaves home to avenge her father’s death. With the one-eyed Rooster Cogburn, the U.S. Marshal with the most “grit,” by her side, Mattie seeks retribution in Indian Territory. One Book One County Montcalm began in 2005 as a part of a national One Book One County movement. In 2009, MCC joined the effort. This year, the public libraries of Montcalm County are hosting the program, which will include a variety of events and multiple book discussions. Eight book discussions are scheduled throughout the county from June into August. Other events include a musical performance, a horse exhibit, free movie nights, a campfire, historical presentations and more. “What can I say about this book that hasn’t been said before?” MCC Library Director Katie Arwood asked the crowd. “This book has been described as uncomplicated and pure. It is an adventure story; it is a thriller. It is a story of the evolving tenderness in a relationship between generations. For discussion questions or more information, visit www.montcalm.edu/onebook.